Have you ever walked into a coffee shop and placed your order, and then been surprised to find your coffee doesn’t taste the way it tasted the last time? The blend is slightly different, the flavour is too strong or too weak, or maybe your cappuccino contains more milk than it did yesterday. Customers want consistency in their products. That’s why it’s important for coffee shops to use accurate weighing scales. How do you find the best coffee scale for your needs? What is a coffee scale? A coffee scale is a specialist digital scale used by baristas, brewers and coffee shops to weigh ground coffee, coffee beans and finished products. Coffee scales also can be used to measure related products, such as tea leaves, refined sugar and other beverages. Coffee scales accurately weigh products to ensure consistency and cost. Commercial coffee businesses are required by law to use approved scales when selling a product by weight. 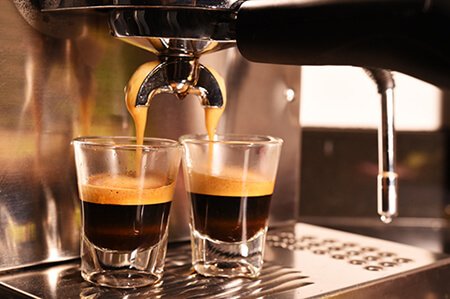 Most coffee shops rely on specific methods to craft the ideal brew every time, providing the product consistency that brings customers back again. 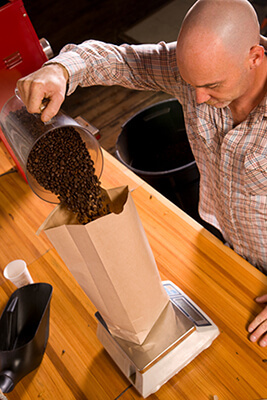 Coffee shops may offer a variety of loose coffee beans that can be scooped and bagged to take home. These coffee beans will need to be weighed in order to determine price. Accurate coffee bean scales ensure that customers are not overcharged for the weight of their purchase, whilst a barista can ensure that profit is not lost through the weighing process. Additionally, artisan coffee shops are likely to create a fine balance of products to make their signature coffee, espresso or latte. In order to achieve product consistency, coffee scales can weigh ingredients such as coffee beans, powders, sugar and milk precisely in order to create the perfect coffee every time. During product packing, coffee beans are weighed to meet a specific portion size. Commercial breweries require each branded bag of coffee sold to be identical in size, but also to weigh the amount listed on the packaging. Industrial coffee scales can be used to checkweigh coffee beans, tea leaves and products to ensure overall product standardisation before they are dispatched to supermarkets and coffee shop chains. There are several types of coffee scales on the market today, ranging from small digital coffee balances and scales for use in kitchens and restaurants to large industrial scales for weighing large sacks of coffee beans and tea. Most varieties of digital weighing devices can be used to weigh coffee; however, some may offer larger weight capacities, greater portability or higher precision. Top-pan balances feature a pan on top of the device and no draft shield. Varying in readability, capacity and price, top-pan balances can meet most coffee weighing needs. Compact balances are low-cost, portable instruments with basic weighing features ideal for most coffee-related weighing needs. Small in size, they can easily fit on kitchen worktops or coffee shop counters. A bench scale is a larger type of scale that can be placed on a workbench or counter. They often feature large weighing pans and greater capacities and offer a variety of applications, including parts counting and checkweighing. Bench scales are ideal for weighing large batches of coffee beans. Platform scales are robust and durable, and can weigh large or heavy objects. They offer higher capacities, and some models feature stainless steel construction for easy cleaning. Platform scales are ideal for weighing large sacks of coffee, tea and sugar in warehouses and packing facilities. Can I use any scale to weigh coffee beans? Place a bag or container onto the weighing pan. Zero or tare the scale. Scoop the coffee beans into the container. Check the weight to ensure the amount is correct. When buying a coffee scale, consider the size or amount of product you will need to weigh at any one time, the overall weight of the product, the applications you need and where you intend to use the scale. If you need to weigh large sacks of coffee beans, your scale must be able to accommodate the capacity to manage this. If you plan to weigh multiple sacks of coffee, you might need to consider a large scale with parts counting or checkweighing features. A&D's SK range of waterproff scales feature durable stainless steel construction allowing for easy cleaning after use. With capacities up to 30kg and trade approvals, this product is perfect product for weighing tea, coffee bags and scoops of coffee beans. A&D's SJ range of compact scales and balances are perfect for any coffee shop or barista, featuring a stainless steel weighing pan for easy cleaning and a space conscious design for easily moving around and fitting on busy worktop surfaces. The SJ-EC range are fully trade certified for weighing scoops of coffee beans, tea and flavourings that can then be sold by weight. Kern's FOB is a simple to use, stainless steel balance ideal for food preperation tasks. The Stainless steel weighing pan is easy to clean and compact in size, allowing it to be used on wrktops and benches with limited space. Ideal for commercial coffee shops and cafes. Adam Equipment's CPWplus weighing scale range offers a wide range of platform sizes and stainless steel weighing pan for easy cleaning after use. Perfect for use in commercial brewries for weighing large sacks of coffee, sugar and tea before distribution.